Any athlete denied a medal at next year's Rio Olympics because of drug cheats will get their own special awards ceremony at a later date. World Anti-Doping Agency president Sir Craig Reedie says it is important clean athletes get their "moment in the sun". Until now, there's been no clear policy for reassigning medals when an athlete has been stripped of theirs for doping. "We are going to make sure that, when the medals are re-awarded, they are presented properly," said Reedie. 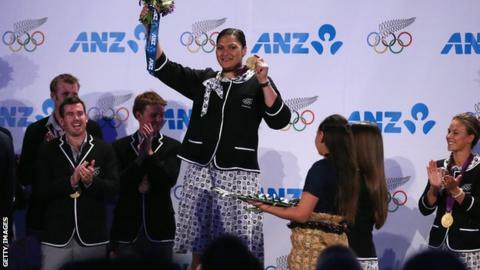 Rio will be the first Olympics to benefit from a recommendation, approved by the International Olympic Committee, ensuring formal ceremonies are organised for anyone who receives a medal after a disqualification. Jamaican Danielle Williams, who won sprint hurdles gold at this year's World Championships, has backed the move. "Hopefully I will never be in that position, but I actually do think that's a good idea," she told the BBC's World Service. "One of the best moments of winning was standing on the podium and hearing my national anthem play and seeing my flag raised. "So I could definitely understand that an athlete who didn't get that chance would love it. I would support that."